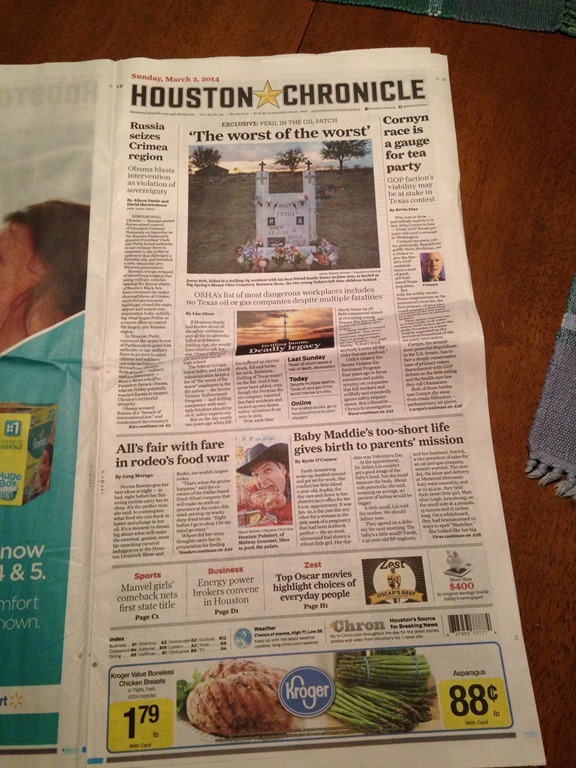 Hang down your head, Hearst Newspapers – HEY, IT'S PAT RYAN'S BLOG! There’s been a running argument over the last 20 years or so about whether or not newspapers should run ads on their front pages. The front page is sacred, the old school guys insist: all news and only news, because this is how we show the reader that they’ve come to a serious source of news. 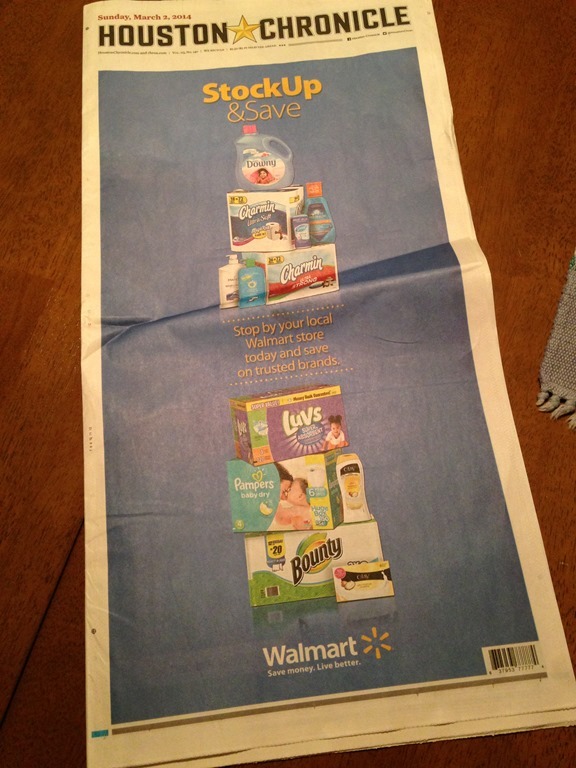 Yes, of course we need to sell ads to stay in business, but we don’t run them on the front page. We just don’t. This is one of those fights that the old school guys have been losing, slowly, one paper after another. A few years back the American Journalism Review ran a good, short history of the issue and outlined reasons for and against. Imagine what they would say if they got a look at this Sunday’s edition in my hometown. Today, over at Houston’s Leading Information Source, they threw in the towel on this argument. Not only do we now run ads on the front page, we run two pages of ads in front of the front page! After the initial shock, I decided I’m not really surprised. More’s the pity. Repugnant and shameful indeed! The only thing mildly amusing about this sacrilege to a treasured Sunday morning ritual was my momentary confusion as my still sleep-addled brain tried to process this front page from the planet Bizarro! And that huge, page-spanning solid block of blue – surely a prank of some sort? I’m guessing my reaction was the same as that of most people around the city (in my age group anyways, and who still get a paper delivered to their home) – a resounding WTF..? Really? It’s come to this? And who else but WalMart! I mean, come on; if you took the Chronicle’s Sunday paper and divided it into two piles, one the news, the other the ads, I’ve got 10 bucks that says the ads already outweigh the former. Isn’t that enough? Maybe it’s just me, but my reaction to cleverly inserted newspaper advertising is to purposely ignore them. 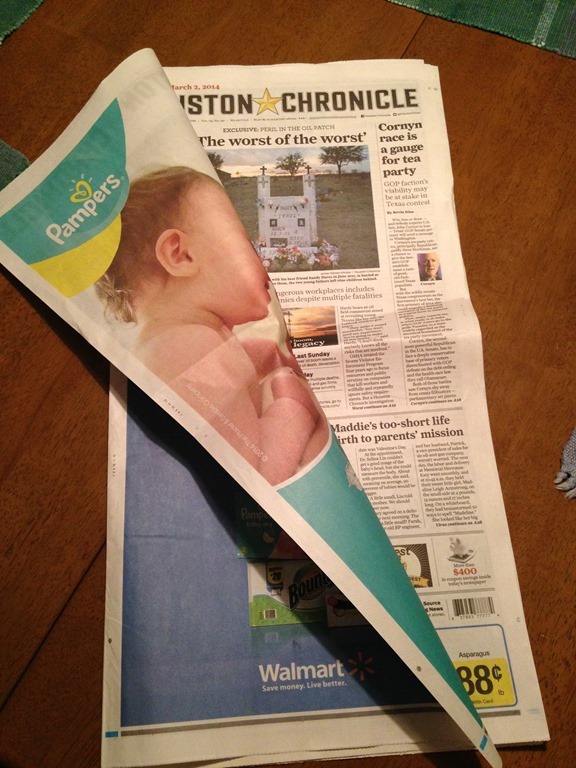 When the Chronicle first started the ¼ page fold-over ads on the front page it became the first thing I do – tossing it aside without a glance. And here’s to you WalMart: this only reinforces my dislike of your store and everything you represent. I wouldn’t shop at your store if you were the last retail outlet in the city to sell toilet paper; I would instead use your newspaper ads!